We're asking a number of Tyler leaders and residents one simple question. 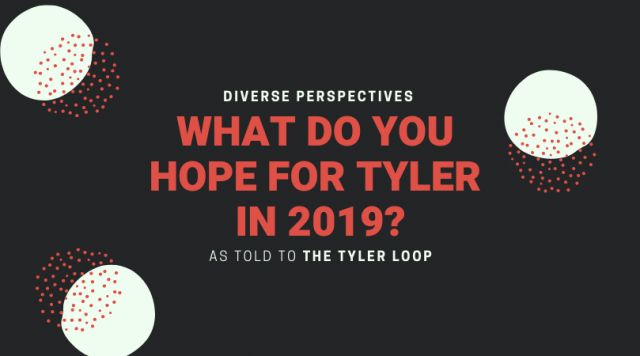 As 2019 kicks off, we’re asking a number of diverse Tyler leaders and residents about their hopes for our city in the coming year. What do you hope Tyler will achieve or attempt in the next twelve months? What do you hope Tyler will leave behind, or prevent from happening? What signs will you look for to indicate that progress is being made? This is our second installment of this series; you can read the first part here. Conversations have been edited and condensed for length and clarity. If you’d like to send along your own hopes for Tyler in 2019, drop me a line. I’ll read every response, and possibly ask to publish your note in the next round. Franks is a philanthropy advisor and president of Your Philanthropy, LLC. 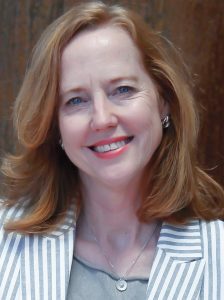 She co-founded the East Texas Crisis Center and greatly expanded the organization’s services for victims of abuse and assault in the region. “I know that behavioral health issues are increasingly on the minds of East Texans. There are many ways agencies, the hospitals, and local government can come together to improve outcomes for individuals and families. But it is very hard work to mesh policies, procedures, and budgets for improved outcomes. So, I wish the many players in this space could break through the noise to find and implement solutions. I also hope that Tyler will move toward a new civic center as I believe it would open new opportunities for us. That has been in the works for a long time, but with little progress. Tyler continues to be a strong philanthropic community. There will be some loss with the passing of Mrs. Ornelas, but positive change as the East Texas Medical Center Foundation moves toward being established. I am concerned about how new ownership of the paper will affect us, and will not be surprised to see significant change sooner than later. I’m not sure most will understand the significance. I realize that for many subscribers the paper is a source of ‘great deals,’ scores, and calendars. But for citizens who take community membership seriously, it is a voice—the voice of yesterday and the voice of the future—sometimes the voice of reason, sometimes of dismay, and the voice of celebration. We need all those voices. Pesina is an attorney and partner at Roberts & Roberts. 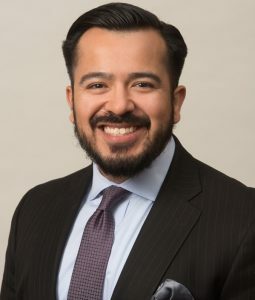 Among his various local leadership roles, Pesina is a co-founder of the Hispanic Professionals Association of Tyler and led the launch of the first-ever East Texas Leadership Summit in 2018. “The state of Texas has set a goal for sixty percent of adults to have a post-secondary certificate or degree by 2030. The Tyler Area Chamber of Commerce and the Tyler Area Partnership for Education have upped the ante: they want sixty percent of our population [to reach that goal] by 2025. I want see how we’re going to tackle that. The Tyler independent school district is doing a great job with the Career and Technology Center; it’s pretty amazing. But overall, my number one hope is that we fully prepare for that goal. Number two: I don’t want to see overrepresentation in certain fields for minority students, where we tell minority youth, ‘You can go be a carpenter,’ much more than we say, ‘You can go to college.’ I don’t want to see Hispanic females consistently encouraged to go into beauty school. Yes, they will have some post-high school certification if they go those routes, but are we really preparing them to take on the world? Education touches everything. It touches the cycle of poverty, equity, and economic development. It’s the single-most important indicator of your future health, how much money you make, and beyond. I’m scared that the district and state will get so hung up on hitting the 60-by-30 target they will miss the forest for trees. I want to make sure we’re fighting that. Bass, a partner at accounting firm Gollob Morgan Peddy, served as mayor of Tyler from 2008 to 2014. She has served in numerous key leadership positions in Tyler and East Texas, and was a member of the first class of Leadership Tyler. There is the challenge of funding. We haven’t gone into debt to pay for these projects, which is tremendous, but how do you manage it going forward when we’re the regional center of East Texas? What can we do to improve the system—whether it’s a new system to time signals, or whatever the latest and greatest is—and how will we pay for and design these improvements going forward? The important thing is to always be looking for new ways to improve. Look at Broadway for example. Years ago, the community made an effort to keep inside the loop on Broadway without a turn lane because they didn’t want to lose the trees. For people who love that historic beauty, is there new technology or new alternatives that can allow us to have improvement without losing the aesthetic beauty of trees that are one hundred and fifty years old? 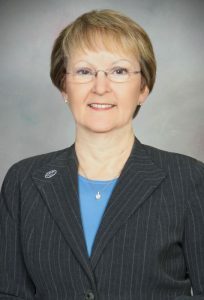 Dr. Tidwell was appointed president of U.T. Tyler in 2017. 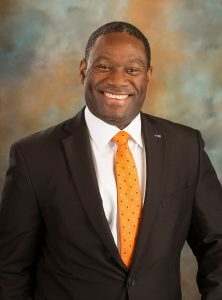 Immediately prior to his arrival in Tyler, he was dean of the College of Business at Eastern Michigan University. Dr. Tidwell’s academic career has taken him to many communities across the country, from Pennsylvania to Georgia to Washington state. “I really hope that in the next twelve months, Tyler will take a look at itself and think about a vision for the future. What does the future of Tyler and East Texas look like? No one person knows the answer. But what I’ve found is that communities that go through that visioning process—and make it an inclusive process—are better able to dictate their own futures, rather than simply react to the general political landscape and economic landscape. It’s something the Chamber of Commerce, higher education and K-12, business leaders, and religious leaders all have to look at. I know these conversations are taking place in various parts of the community. County, city, Chamber of Commerce, and economic development folks are having critical conversations about our local economy. TISD is working on a strategic plan, not just for facilities, but for what teachers will be able to accomplish in the classrooms, and pulling in parents to make sure students will be proactive in their own success. But these conversations are happening in isolation. They need to come together, and not just in Tyler, but across East Texas more broadly. The two million people who live in East Texas need to have a common vision to really see things take off in our region. As U.T. Tyler, it is important for us to be part of the conversation. As I’ve said many times, as higher education goes, so goes the community or state or nation. But higher education doesn’t have to lead the conversation. We’re a piece of it; we’re not the answer. Want to share your hopes for Tyler in 2019? Email our editor. Your note may be included in the next installment of this series.